Imagine an electric vehicle that can travel endless distances without ever needing to stop at a recharging station. That sounds impossible, right? Because electric vehicles run on batteries, and at some point, you need stop and charge those batteries. Not this one. 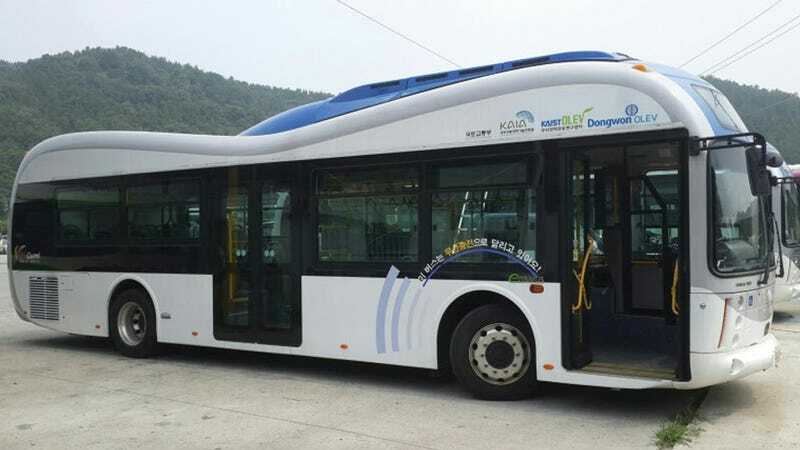 Two new electric buses just hit the streets in the city of Gumi, South Korea that literally get their power from the streets. These so-called Online Electric Vehicles (OLEV) receive power wirelessly from electrical cables laid underneath the surface of the street using Shaped Magnetic Field in Resonance (SMFIR) technology. The buses carry a battery that's one-third the size of those in traditional electric cars and charges by collecting 100 kilowatts-worth of electricity from magnetic fields created by the electrical cables, as the bus rides about 17 centimeters above the surface of the road. They're efficient, too, using 85 percent of the power that's emitted from the lines. Researchers have high hopes for the technology, which was originally developed by the Korea Advanced Institute of Science and Technology (KAIST). The SMFIR tech was unveiled a couple of years ago at Seoul Grand Park, a zoo and amusement park in the country's capital, but the hope is roll it out in more cities over the next few years. Any why not? The start up costs are minimal since the power cables don't need to be laid under the entire road, just sections along the route, and because those sections are only activated when a bus drives over them, the power use is minimal.